In stock market trends we’ll look at how to identify bull and bear markets. This is a critical component of stock market investing that participants need to keep track of on an ongoing basis. We don’t want to get into the market if it’s about to head south for a few months or years. And we might also want to reduce our exposure to the market if we are already heavily invested. On the other hand, it’s useful to know when a bear market is coming to an end and when a bull market is just beginning. Hefty gains can quite often be achieved in the early stages of a bull market. Identifying stock market trends is easily done and will improve your stock market returns. Lets consider the best way to determine stock market trends. Which stage of the market are we’re currently in? Using this method you can get a feel for where we might be in the cycle based on average market valuations. The one big problem with this method is that it’s subjective. So it shouldn’t be used in isolation. the levels of economic variables such as interest rates, unemployment levels, inflation etc. While these metrics are useful, by themselves they don’t paint a picture clear enough to base sound investment decisions on. We can conclude that while fundamental factors add some value to our analysis, they are secondary factors. Technical analysis provides the clearest signal. But the simplest and most useful indicator for stock market trend analysis is the moving average. A moving average is an average of past prices over a certain period that smooth out the gyrations of the market to give a clear indication of the trend. Because bull and bear markets are long-term events, we should use a long-term chart to view them. A ten year chart will give us a good display. For the sake of clarity, a weekly chart using end-of-day prices would be suitable. A 30-week or 40-week moving average is a good choice for displaying market cycles. I’ve selected a 30-week moving average in this case. The 30-week moving average is more responsive than a 40-week. This chart of the S&P 500 index clearly displays market cycles. 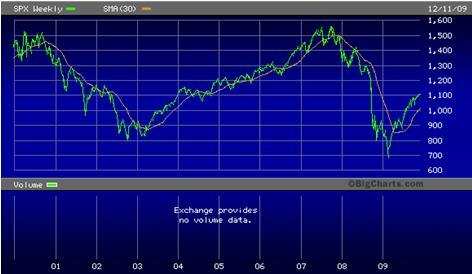 We can see that a bear market started in late 2000 as the 30-week moving average headed downwards. This downward momentum continued until mid to late 2002 where it moved sideways for a stretch before moving into a bull market close to the middle of 2003. By very early in 2008 the down trend became fairly obvious as the moving average headed down again. And turning up in 2009 signaled market strength. This type of stage analysis can be profitably applied to stock market sectors and individual stocks. Stan Weinstein’s excellent book titled: “Stan Weinstein’s Secrets for Profiting in Bull and Bear Markets” outlines a great strategy for picking winning stocks based on this idea. Keeping track of the stock market trend is as easy as putting a moving average on a chart. A quick glance at this chart each week will let you know how the market is fairing. This technique is also useful for keeping track of the sectors that the stocks in your portfolio reside in. For this task I usually use a three year weekly chart with a 30-week simple moving average. I like to keep track of the main stock market sector trends as well as those that relate to my current stock holdings. If the market is in an uptrend, the sector your stock resides in is in an uptrend and the stock itself is in an uptrend, then you’re moving in the right direction on all accounts. Stock market trend analysis is so simple and effective we should all use it to our advantage. Note: Simple moving averages (SMAs) can be used to display long-term trends, but for trading, I like to use exponential moving averages (EMAs) as they are more responsive to recent price movements.